Above: The Bovina creamery building. Photo by Stephen O'Grady. Calico Holdings, a company owned by John Finn, officially closed on the creamery on Friday, March 4. The seller was the McIntosh family, which has owned the creamery for over four decades. Finn is the founder and CEO of Indiepay, a company that handles payroll and accounting operations for companies in the film and television industry and has offices in Delhi. “We hope to have the creamery up and running by late fall 2016,” Finn said in an email. The division of Calico Holdings that will operate the creamery is called Bovina Valley Farms. That is the name that the new dairy enterprise will go by, at least for now, Finn said. News of the plans for Bovina’s creamery comes on the heels of a related development in nearby Andes: Dirty Girl Farm, a goat milk dairy, is moving ahead with plans to purchase and relocate its creamery to the farm buildings across from the Andes Town Hall—another sign of the resurgence of small-scale dairying in rural Delaware County. Above: Photo by Jane Margolies. The brick creamery building that Calico Holdings has purchased in Bovina was constructed in 1942. It was a replacement for a wooden building erected in 1902, according to Bovina Historian Ray LaFever. The creamery first produced butter and then powdered milk. During World War II, it made dried eggs under a contract with the federal government. According to LaFever, the Bovina creamery was always a co-op—run by the farmers who brought their milk there in metal cans. When the dairy industry shifted from cans to more expensive bulk tank equipment, the farmers voted to shut the Bovina creamery down, just as other small-scale farmers who couldn’t afford to make the switch were forced to do across the country. The McIntosh family purchased the building and for many years Roger and Chuck McIntosh operated their auction business out of the creamery, holding popular Saturday evening sales. In the big, high-ceilinged space, dusty framed pictures and deer-head trophies adorned the walls above rows of folding chairs. People bid on a parade of farm implements, antique furniture and household items, fanning themselves with their bidding cards in summer. Chuck McIntosh’s wife, Betty, signed people in from a tiny room near the entrance, opposite the snack bar, while her husband sat on a platform at the front of the room and served as the auctioneer and congenial master of ceremonies, joking and often cajoling the audience into bidding a dollar on cardboard boxes of assorted junk. In 2002, the McIntoshes moved their auction business to Margaretville. “No one thought the creamery would ever operate as a creamery again,” said Chuck McIntosh in a phone interview. When John Finn, who was raised in Bovina and graduated from Delaware Academy, began discussions with the McIntoshes about the idea of buying and reviving the creamery, processing milk was no longer even a permitted use under Bovina’s town zoning. But the McIntoshes made the case for a variance before Bovina’s Zoning Board of Appeals and secured it this past fall, clearing the way for the plans to proceed. Under the terms of the contract of sale, the McIntoshes had to empty out the building, which they had been using as storage space. The family held a series of auctions there in the fall, until the weather got too cold, and recently they began to include items from the creamery in their Margaretville sales. According to Finn, the creamery building will need a new roof, windows and a HVAC system. While he says his plans are still in development, he expects to enlist other investors in the enterprise and hopes that Bovina Valley Farms will produce cheese, butter, yogurt and bottled milk. Finn’s brother, Dan Finn, who makes a widely acclaimed Alderney cheese from his organic dairy farm just over the border in Delhi, will process his cheese in the creamery building. “It’s nice that it’s going to be a creamery again, and it’s nice that it’s two local boys who are doing it,” said Chuck McIntosh. But first, the McIntoshes have to finish clearing out the place—an effort that has produced some interesting finds. Roger McIntosh recently unearthed an old camera and a box of negatives of historic town photos. Chuck McIntosh, recognizing their historic value, brought them to Ray LaFever, who has been posting selections on his Town of Bovina Historian Facebook page. Among the finds is the early 1940s picture of the creamery, probably taken by James Hilson, below. 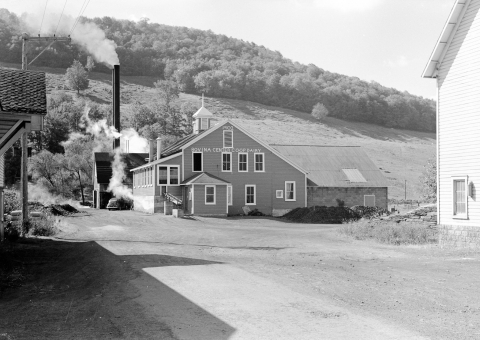 Below: A 1940s image of the Bovina creamery, probably taken by James Hilson. Image via the Town of Bovina Historican Facebook page. Cauliflower festival honors "cabbage with a college education"